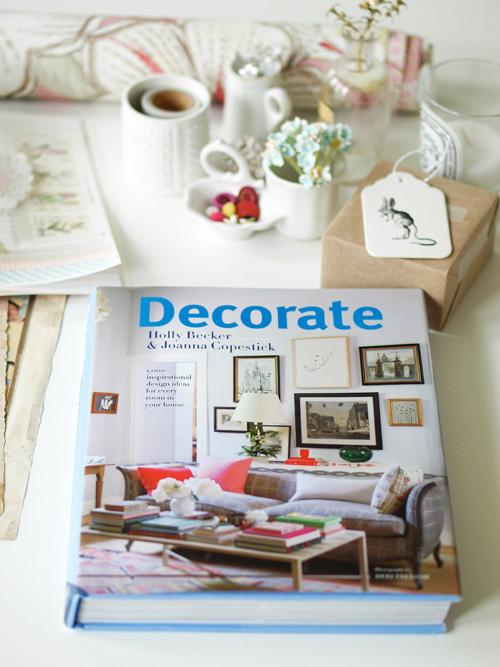 I first got to know Holly Becker many years ago when I found her website, decor8 and shared it here. We got chatting in the comments section and I wound up taking her Blogging Your Way Class and even writing a little bit on her site here and there. So thats my disclaimer before I recommend her book (co-written with Joanna Copestick), Decorate: 1,000 Design Ideas for Every Room in Your Home. You know how sometimes you order a design book online and when you get it, its, well, a little thin and disappointing? That is NOT the case here. This book is literally jam-packed with photographs, tips, pointers, floorplans and inspiring ideas. I dont think I had seen at least 90% of the spaces photographed (this is rare when you look at design online all day), and they authors included spaces from L.A.s Laurel Canyon to Paris; from Ohio to London. Shes included spaces from interior designers, bloggers, a fabric designer, photographers and even the worlds most fabulous potter. In a book this complete, nothing is missed. Because the book is so thorough, one of the best things about it is using it one room at a time. Whether youre planning a thrifting trip, re-arranging an art wall, doing a complete reno of your kitchen, or just want to make a few cheap moves to make your bathroom look a bit bigger, theres a very complete section in it that youll find helpful. In addition, the book covers a wide variety of styles; theres something for everyone here!